Murang Generics Pharmacy is one of the most promising brands in the pharmaceutical industry. Its winning formula combines affordable, yet effective generic drugs with good customer service. Nowadays, it’s really hard and costly to get sick. Hospital bills can soar higher along with prices of prescription medicines. This is why generic drugs have become more popular. Consequently, generic pharmacies abound. 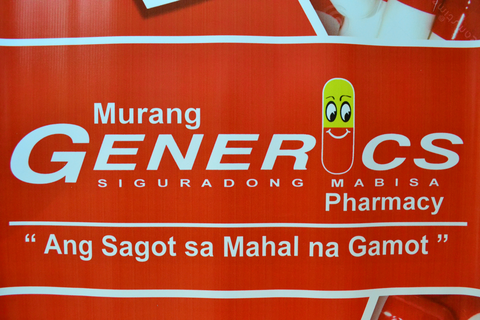 Murang Generics Pharmacy is among the most promising generic drugstores today. It was conceptualized in 2008 by an entrepreneur who has wanted to provide ‘sagot sa mahal na gamot’ (alternative to expensive meds). “The owner saw this as an opportunity to set up his own pharmacy. Not only will he earn, but he’ll be able to provide a much cheaper but very effective generic medicine for the less privileged,” said marketing officer Lianne Cabangin. The company established its first outlet in Marikina and started expanding in and out of the capital. “We then opened stores in Tondo, Cubao, and Bicol. Now, we have nine outlets in the country,” Joana Verdeflor, also a marketing officer, disclosed. All of their generic pharmacies except for one are company-owned. They opened their first franchised store this year in Cebu. The volume of franchising inquiries is just starting to pick up. Murang Generics is currently active participating in various events for exposure. “Because of the expos we’re attending, we’re now receiving lots of inquiries. From 100 interested franchisees last June, it rose to 270 in July,” Verdeflor revealed. Those interested franchisees are coming from all sectors, according to Verdeflor. There are young entrepreneurs, doctors, and even overseas Filipino workers (OFWs). “We can pretty much say that the franchising opportunity in the pharmaceutical industry is big,” she added. However, it takes longer for the company to evaluate franchise applications because a significant number of applicants are young entrepreneurs. “Because they’re young, they’re mostly risk-takers. It’s a great attitude to have, but we have to assess them thoroughly to prove that they can run the business. They will carry the name of the brand, after all,” Cabangin emphasized. One of the reasons they started franchising only this year is the logically high risk in the pharmaceutical industry. “Going out there is complicated. You have to consider the fact that franchising is sustaining the name of the brand. But timing is everything, and we’re ready to do the big plunge this year. We’re still a work in progress,” Cabangin said. Murang Generics Pharmacy is not fazed by its being a new entrant to the market. It is slowly getting the attention of consumers for its affordable products and exceptional service. “We want to build our credibility slowly but surely. Our pharmacy doesn’t just sell medicine, but happiness, too. 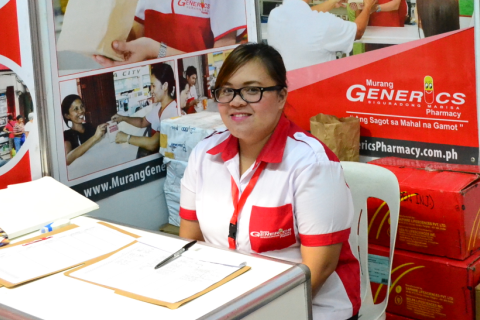 It motivates us to work harder when we see our customers are happy because they can afford the medicine that they need,” Verdeflor shared. Do you want to get a franchise for a Murang Generics Pharmacy store? Check out the generic drugstore’s online directory listing here. Photo shows marketing officer Lianne Cabangin.